Iron ore imports by China rebounded to an all-time high last month, capping record annual purchases, as slumping prices boosted demand for overseas supplies in the biggest user and some local mines were shuttered over winter. Shipments climbed 29 percent to 86.85 million metric tons from 67.4 million tons in November and 73.4 million tons a year earlier, according to customs data today. Imports last month were the highest level on record, according to data compiled by Bloomberg dating back to 1990. Over 2014, they totaled 932.5 million tons from 820.3 million tons in 2013, the data showed. The steel-making ingredient collapsed 47 percent in 2014 as BHP Billiton Ltd. (BHP), Rio Tinto Group and Vale SA (VALE5) raised low-cost production, spurring a global surplus just as growth in China slowed. Prices may climb this half on seasonal trade and moderating global supply growth, according to Morgan Stanley. Some mines in China are closed over the winter months, boosting mills’ reliance on stockpiles and imports, and separate data today showed a further drop in reserves held at ports. “This is a good result and can partly be explained by seasonal restocking demand,” Australia & New Zealand Banking Group Ltd. said in an e-mailed report. The increase in imports, together with the decline in port stockpiles, suggests that underlying demand has improved, according to the bank. Ore with 62 percent content delivered to Qingdao, China, lost 2.2 percent to $68.74 a dry ton today, according to Metal Bulletin Ltd. While the benchmark dropped to a five-year low of $66.84 on Dec. 23, it climbed to $71.49 on Jan. 6, the highest level in a month. Stockpiles at China’s ports shrank 0.8 percent to 99.85 million tons as of Jan. 9, dropping below the 100 million ton level for the first time since February, according to Shanghai Steelhome Information Technology Co. The holdings shrank for a seventh week for the longest run of declines in two years. Reserves fell 12 percent since peaking in July. About 71 percent of the port inventories are owned by mills and the remainder belongs to traders, Steelhome said in an e-mailed report. The holdings, tallied at 44 ports, are sufficient to support steel-making in China for 30.37 days, it said. Imports by China will probably expand further this year on increased production by major seaborne suppliers, whose output is expected to displace higher-cost local mines, according to Singapore Exchange Ltd., which offers iron ore derivatives. Miners’ shares pared losses amid a global equity selloff spurred by collapsing oil prices. BHP, which also produces crude, lost as much as 2.1 percent to A$27.91 before closing at A$27.97 in Sydney. Rio ended 1.8 percent lower at A$57.46 after being down 2.3 percent, while Fortescue Metals Group Ltd. (FMG) settled 5.2 percent lower after losing 6.3 percent. Iron ore prices may increase 10 percent in the first half as seasonal expansion in Asia’s steel industry stabilizes trade flows, Morgan Stanley said in a report yesterday. The raw material will average $82 in the first half before declining to $77 in the second half, the bank said. Hurt by a housing slump and industrial overcapacity, China’s economy probably expanded in 2014 at the slowest pace in more than two decades, according to a Bloomberg survey. The central bank cut interest rates in November for the first time since 2012 to boost growth. “With winter approaching, buyers were more willing to step up to the plate, especially given stockpiles had fallen materially,” Jeremy Sussman, an analyst at Clarkson Capital Markets LLC, said before the data were released. 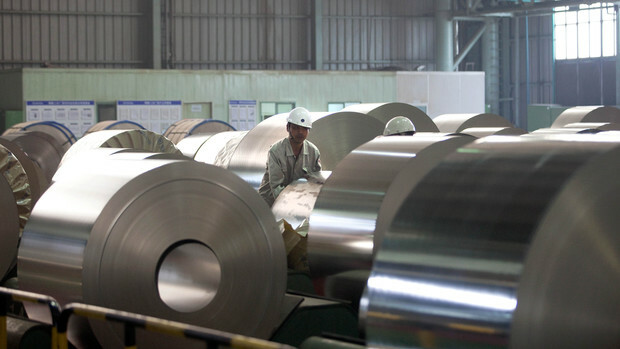 Imports will continue to grow in 2015, driven by higher steel output and a rise in low-cost seaborne supply, he said.